All this because he couldn't get into Art School. Nazi Germany is the period in the history of Germany between 1933 and 1945 during which Adolf Hitler, as German Chancellor, took over most of Europe, and (officially) started the Second World War, which flattened entire cities and cost tens of millions of lives. Under Hitler, concentration camps were constructed, and later became death-camps, which killed an additional six million Jews, three million non-Jewish Poles, 700,000 Soviet prisoners of war, as well as Romani, homosexuals, and anyone else who got in the way of the German geopolitical strategy of seizing Lebensraum, or living space, in Eastern Europe. Like other fascist movements, the Nazis were intensely nationalistic and thus obsessed with achieving ethnic homogeneity within claimed national territory. Unlike most other fascist movements of the time, "Germanness" was given a racial bent, and this provided the nonsense about Blut und Boden[note 1] for an ideological gloss on the geopolitical strategy of territorial aggrandizement. In the 1945 diplomatic settlement, the Soviet Union got control of the eastern half of Germany that was not slated for inclusion in a redrawn Poland (Poland gained compensatory territory after the Soviets took back the lands they had incorporated in 1939) while the United States and its (now junior) allies, the UK and France, controlled the remaining two-thirds of Germany. West Germany prospered while East Germany continued to suffer Stalinist oppression. A divided Germany was a Germany that could be deemed safe by all of the victorious allies. In the end, though, a unified and democratic Germany, where extremism is against the law and Scientology discouraged, became the strongest economy in the European Union. 3.1 About the word "Reich"
5 How could they be so popular? WWI (right) shakes hands with WWII (left) at the opening of the new Reichstag, 1933. “”Even after the triumph of the 1930 election, many intelligent and informed observers of the German political scene felt that the Nazi party was bound sooner or later to collapse and break up into its component parts. Its social base was diffuse – that of an out and out protest party; it had no clear political programme to offer, only a contradictory amalgam of social revolutionary rhetoric and reactionary impulses; and not least it was heavily dependent on the personality cult surrounding the demagogue Hitler – seen as the mouthpiece of petty-bourgeois resentments, but ultimately a dilettante who, despite temporary success in the conditions of severe economic and political crisis, was bound in the end to succumb to the real power bastions and traditional ruling elites. The early 1930s was a pretty lousy time for most the world, what with the Great Depression and all; this led to increased support for extremists, as well as the fall of most liberal governments across the world. The conservatives got over their hang-ups with the Nazis and entered into a governing coalition. Hindenburg was just unsure about them being republican instead of pro-monarchy, like many German conservatives, and Pan-Germanist instead of solely for the existing Reich. (Their leader was Austrian, after all.) They planned to use the Nazis as a cudgel against the left, but they wound up being cudgeled along with everyone else. Hitler pulled a pretty deft maneuver by attracting the socialists to his side—before decapitating the movement, murdering their leaders, and Nazifying their supporters (either through fear or by re-educating them in the newly-formed concentration camps). If you've seen their 1920 manifesto , it opens with a disturbing racial diatribe, but as you read on, there are promises to raise the status of working-class Germans: free education, senior entitlements, more state control over industries, and redistribution of wealth. He even sponsored ocean cruises and youth camps available only to working-class people. After the Nazis' meteoric rise in popularity that left them as one of the largest parties in the Reichstag (Parliament) and a failed attempt to channel support away from him, Hitler was appointed Chancellor in 1933.. Shortly thereafter, the German Reichstag building was burned and left-wing extremists were blamed for it (although the Nazis may have done it themselves)[note 3]. An "emergency" was declared and Hitler was able to harass voters into voting for him and his right-wing allies. This coalition government gained a slim supermajority in the Reichstag and wasted little time granting him dictatorial powers less than a month later in the infamous 1933 Enabling Act, leading to him rewarding his political allies by banning their existence in favor of a one party state. Finally, with the death of von Hindenburg, he consolidated the offices of Chancellor and President to create the position of "Fuhrer" in order to remove the last legal opposition to his rule. External dissent removed, internal Nazi opposition was crushed in 1934, cleansing the party of both the paramilitaries and left-wing Nazis, who didn't align with Hitler's backers. The only fascists who were intelligent were the ones who controlled the upper echelons of the state. Nuremberg IQ-tested the top Nazi leaders who hadn’t blown their brains out or chewed on some cyanide, and they were consistently geniuses. However, if you observe the Brownshirts (for instance), they were all driven by catechisms and myths, worshiping the WWI dead. That's why the Night of the Long Knives was necessary: most of the SA shock troops were the sorts of people who would end up being labeled "degenerates" and thrown into labor camps in fascist societies. Eventually, the man they dedicated all of their time to elevating managed to attract enough 'normal' sadists who didn't make him feel sick to be around, and who were at least vaguely employable. His home front mostly secured, Hitler used the western allies desire to avoid another World War (as well as their lack of desire to start one when they weren't ready to do so) to convince Britain and France that his re-militarization of the Rhineland, annexation of Austria and his occupation of the Sudetenland would be all he wanted. After his invasion of the rest of Czechoslovakia, they wised up and by the time he ordered the (successful) invasion of western Poland in 1939 decided war was better to letting him do whatever he wanted. That ultimately touched off WWII in Europe and after six years of fighting and the death of 25 million Europeans (mostly Russians and other East European populations), Hitler, together with many other senior Nazi leaders, chose suicide. “”Workers in the Third Reich lost most of their freedoms and rights… with their unions gone, workers had no say in wages and conditions of employment, which were now regulated by the state. Despite economic recovery, real wages never rose to what they had been in 1928. Taxes were high; the cost of many consumer goods such as clothing and beer increased… on the other hand, workers were not cast into a condition of deprivation. To some extent, workers were pacified by what the Nazi state did provide. Hitler knew he needed the support of German industrialists and Wehrmacht aristocrats. And by support, we don't mean bumper stickers: They paid his rent. They paid the salaries of the Nazi functionaries, the SS, and the SA. Indeed, he won their support by promising he'd squash Communism, organized labor, and pesky democracy in general. So he was publicly socialist and privately capitalist. This is what fascists always do, they try to co-opt the populism of the left. Like National Syndicalism in fascist Italy and Spain, he put all workers into one big national union (German Labour Front) which was given recognition and protection by the state. Sounds great, until you realize he put a pro-management stooge in charge, whose job was to depress wages. Strikes were forbidden. The mandatory dues of this union became a slush fund. Germans also paid five Reichsmarks per week in a pre-leasing scheme for a Volkswagen Beetle, but those deliveries were put on hold. Now, it's true that employment went up, since it became harder to fire employees. But it was also harder to switch jobs thanks to a new "workbook" system, which management was in control of. Also, women were no longer included in employment figures, so the jobless rate had to tumble. For the peasantry, Hitler gave farmers control of their land. No longer could it be foreclosed on or sold off (as long as you were Aryan, that is), and price controls were set to make their produce more valuable. But this also chained the farmers to their land like the serfs of old. The bloated, bankrupt Junker farms (who had disgraceful "loan" agreements with the Weimer government) were left alone, despite promises to nationalize them. Finally, the price controls on food inflated other supplies so as to cancel out the gains for the farmer. It is also true that businesses, factories, and estates were seized. However, most of those were owned by Jews, or people who annoyed the Nazis. But again, Hitler himself put a stop to much of this. The corporatist economy was an outgrowth of his "leadership principle" (Führerprinzip); any study of the Third Reich tends to highlight how ad hoc a lot of their policies were. So how did the German economy run? Quantitative easing on crack. Hjalmar Schacht was put in charge of Hitler's economic policy, or more accurately, the Nazi printing press. Different schemes were hatched to finance rearmament, which eased unemployment and made the moguls a tidy profit. The German "economic miracle" was impressive, but it could only be sustained temporally. So the real Nazi economy was Keynesian, not Marxist. This came to a head when Gregor Strasser and other members of the Reichstag supported a Communist plan to seize the Junker plantations. Hitler knew this would not go over with his benefactors so, through sneaky political maneuvering, he prevented his party from siding with the Communists. Hitler never forgot their disloyalty, and he had Strasser purged in what came to be known as "Night of the Long Knives". In one of the biggest propaganda moves by the Nazis, they declared Germany under their reign to be a "Drittes Reich" (Third Reich). It was largely a move by propagandists trying to legitimize their rule by linking their "empire" with historical German empires that they considered to be terrific such as "First Reich" known to most sane people as the "Holy Roman Empire (900's - 1806) and the "Second Reich" which was the German Empire as it existed from 1871 until 1918. [note 4] According to the Nazis, Hitler's new "German Empire" would be the third and greatest of these. Instead, it lasted for twelve years and ended with the utter ruin and defeat of Germany. In a regime known for making grandiose proclamations, this was likely one of the biggest, and with the least support. First, stepping back a bit, the official name of the German Empire (1871-1918) was the Deutsches Reich ("German Realm" or "German Empire"). Following defeat in World War I and the abdication and removal of the various German monarchs (Imperial Germany being a federation of various monarchs under the head of one single emperor), a republic was declared; however, the official name of Germany remained "Deutsches Reich". Although this period is known by historians, much in the same way the Byzantine Empire has that name, as the Weimar Republic and the public themselves mostly took to calling it the Deutsche Republik by the mid 20's, the name (and identity) of the nation never really stopped being the "Second Reich". Going back even further, the identity of the Holy Roman Empire, famously stated to be "neither holy, nor Roman, nor an empire", as a German "First Reich" is strained at best. Although it helped set the stage for what would become Germany, up until the very end it was primarily a claim by whomever was emperor to be the Roman Empire. In the end, both terms have fallen out of favor for either and most people who use them are looked down upon for accepting Nazi historiography. Reich is a German word that does not translate easily into English. It is related to the English word "rich" (meaning "wealthy"), and when "reich" is used as an adjective, means exactly that in German. However, as a noun, it more correctly translates as "realm", although it is often translated into English as "empire". The German word for "empire" (a monarchy ruled by an emperor) is Kaiserreich ("emperor's realm"), while a kingdom is a Königreich ("king's realm"). The German toponym for France is "Frankreich", literally, "Kingdom of the Franks", even if the Franks have so fully assimilated into the French people and France has not had a monarchical government since 1871. The Dutch call their democratic country a 'rijk', a cognate of "Reich". A good translation for the English word empire (besides the obvious choice of "Imperium") would be either "Großreich" meaning roughly big-realm or "Weltreich" meaning world-realm. Notice how the term "Großdeutsches Reich" also alludes to the term "Großreich" while also invoking the old term for a "Germany" that includes Austria. By the way, the English word "rich" used to have a similar meaning as a noun, and this is retained in the compound English word bishopric - a place where a bishop is in charge, i.e. a bishop's realm. As for pronunciation, the Germans say the "ch" almost like the beginning of the English word "hue"—it sounds like a hiss, suggesting a "shush" or "should" sound but without bringing the teeth together. The "ei" is pronounced like the "i" in "like". “”Suppose that Hitler's programme could be put into effect. What he envisages, a hundred years hence, is a continuous state of 250 million Germans with plenty of 'living room' (i.e. stretching to Afghanistan or there-abouts), a horrible brainless empire in which, essentially, nothing ever happens except the training of young men for war and the endless breeding of fresh cannon-fodder." As mentioned previously, the Nazis believed themselves to be the start of a new, endless era of greatness for Germany, and generously wanted to share this greatness by way of conquering a lot of land and forcing the places they didn't outright annex into a subservient status. This plan: expansion of Germany and exploitation of the rest of the world for Germany's benefit was the major driving force of both Nazi militarism and the War itself that would bring them down. Although most of it was not implemented, the parts that were showcased just what kind of horrible world we would live in had the Nazis won the war. See our article on The Holocaust for more. The main goal of pretty much every Nazi action after annexing the German areas of Europe around it was to acquire all that land to the east of them so they could "relocate" and enslave at best, exterminate at worst, the local Slavic (and non-Slavic) populations in favor of German colonization. Only partially implemented, the brutality of the Nazi occupation would be a key factor in turning the population against them and into the arms of the Soviets, because while the Soviets were little better politically and Stalin was a right fucker, he wasn't so stupid as to try and kill everybody in those non-Russian republics while also still fighting a war. The primary categories people already living here would have found themselves in was split between "Germanization " and "undesirable" - those deemed acceptable to the Nazi ideology for "better treatment" or assimilation and those who would be killed or deported to more eastern territories (such as the ever popular Western Siberia). For some, this was implemented essentially during the war, and for others, it would be implemented afterward, with the idea that most areas in the first zone (west of the dotted line) would be "Germanized" in 20 or so years. Poland, being the first nation to fall after the Nazis no longer had to pretend to care what the Allies thought, took the brunt of the implementation with much of its political, cultural and religious leadership imprisoned or murdered, and it was planned that ultimately the Polish would be wiped out, through assimilation in Siberia and being forced to not marry and produce children for those left in Poland as German slaves. The Baltic, in comparison to Poland and Ukraine, were planned to ultimately lose their statehood but, with the exception of the Lithuanians, only face about half of a population removal for incoming German settlers (obsession with blood purity meant that the Lithuanians, with high rates mixed marriages with Slavic people, were not acceptable to "become Germans.") Ukraine, due to its prime land, was to face higher rates than the Baltic and had to endure a second famine after the Holodomor in order to help along its impending colonization, but overall faced fewer deportation rates than some other areas.. Ukraine was also one of the areas most welcoming to Germany and yet also against it, as Ukrainian nationalism was prevalent before Soviet occupation and rose up again when it became apparent that the Nazis were not any better than the Soviets. In the areas further east, the plan gets more fuzzy as the ongoing state of the war and ever-shifting front lines meant that any real implementation of the plan was ad-hoc and subject to interruptions. However, as everything up to the Ural mountains was slated to become part of Germany, in the end, it was to face the same treatment. Two administrative divisions were planned, one for the broad area of Russia and the other for the area of the Caucasus up to around Stalingrad. Populations to not be enslaved or Germanized would be deported or killed, and Germany would stretch from Alsace in the west to the Ural mountains in the East, with a permanent guard keeping the former inhabitants from crossing back in and ruining "German Civilization". Hitler viewed the United States of America as a rising global power and Germany's likely rival for hegemony in the post-New Order world. The Nazi plan to seize land in Eastern Europe and Russia was partly motivated by a desire to have a resource base that would leave Germany competitive against a presumably hostile the United States. The nature of the future conflict between America and the Greater Germanic Reich, however, remained vague. German planners were more occupied with work in the east to devote time to it, and Hitler believed that he would be dead before it would manifest. The problem of the United States would be one that a future Führer would deal with. What planning there was amounted not to an impractical invasion of the American mainland (as is often shown in media), but long range bombers (such as the Amerika Bomber ) destroying eastern cities and forcing submission (much in the way the Battle of Britain), ending a "war of the Old and New World" where the Nazis would assume global leadership by simply having the stronger position, even if it never truly "took over" the American dominated sphere. If it did come to a fight, however, which the Nazis made all attempt to put off even into 1941, with America all but officially part of the allied side , Nazi plans focused on splitting American society up, such as encouraging Native American resistance to fighting Germany, even going so far as declaring that Natives were Aryan (making them somehow better than the country ruling them as inferiors to be assimilated into Society or excluded on reservations) and possibly even handing out land from a defeated America to tribes.. While there was some Fascist support among Indians, overall, most Indians seemed to find America a better deal than Germany and hopes that they would rather fight the US than fight Germany never materialized. Outside of the United States, the Nazis gave little thought to the rest of the Western hemisphere beyond "Economic opportunity" and "land to get ethnic Germans back from" while warning their own people to the "dangers" that comes from racially mixed societies. Like the rest of Europe, Africa, and Western Asia, Latin America was to become simply a source of resources and power for the German Empire, ruled by local fascist groups. As far as whether it was a mistake for the U.S. to hire German scientists...that can't be judged so easily. Considering they were looking toward war with Russia, and Russia did the same, one tends to think not. After all, the Germans looked to the USA and the UK's eugenics programs as a muse. They just took it to the logical end. See the history of IBM's hollerith machine and numerous other US corporations who helped build Nazi Germany. There is a very complex, rich history between those countries and the horrors of the twentieth century. 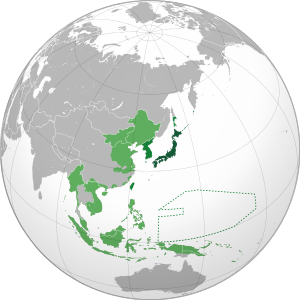 Germany was, in a move of realpolitik , allied with the Empire of Japan, a fellow militaristic nation seeking to exploit the world for its own Benefit. Unlike Italy, which was in the end never going to be anything more than a subordinate partner in the German world, Japan was to be given free rein in the territories allocated to it - A line including everything east of the Yenisei river , running along the border of China and then British India to the Indian Ocean. . Germany was also prepared to give up Oceania to Japan, including former colonies it had lost after the First World War, in the name of Japanese help defeating the allies. The Germans were not really happy about this, though, as it meant that the Japanese would replace and remove the existing white populations there , and most expected Japan to use Australia in the same way Germany was planning to use Eastern Europe: a base for colonial population expansion. Long term, Germany planned to fight Japan, its current alliance thought of in the same way it had allowed Soviet conquests in Eastern Europe before invading the country, although it was expected this future conflict "would be centuries down the line" . At the least, Hitler looked at Japanese military aims as a saving move for German plans: just as German annexation of Europe would take time, Japanese integration of Asia into a Japan-centered system would "take 50 to a 100 years" In the end, an "apocalyptic fight" between "Culture Generators" (The Aryans) and "Culture Bearers" (The Japanese) was expected, with the possibility Germany could lose due to simple population differences, and that "this would be a bad thing." How could they be so popular? It's also worth noting that the nazis actually did a bunch of PR to hide what they were doing from the German public, ranging from posters reminding them of false accusations of atrocities from the allies in WWI to Theresienstadt ; basically a whole model concentration camp intended to be shown to the media as an example of how humane the camps were. The Nazi war machine also ran on the backs of an apolitical class with liberal leanings. Men like Albert Speer complied with the Nazis in the hopes of gaining positions in the new Reich. Like many parties, especially ones bent on dominating the lives of a population, the Nazis established a myriad of special clubs and organizations for party members, that were intended as alternatives to the public organizations used by everyone else. So, for example, they had their own welfare program, sporting organization, "Women's League" and most famously, the Hitler Youth, which was the Nazi version of the boy scouts and girl scouts (the main "Hitler Youth" was a young boys' association, but there was also a girls' association alongside it). Using these - which later became the only legal organizations one could join after the Nazis took power - the party could project its image and propaganda into almost every part of a person's life while influencing children from the beginning to support Nazi ideology. The Nazis were also responsible for the recovery of Germany after the depression; taking a nation broken by both the depression and punitive restrictions placed on it by World War I and making it a world power again would make its population willing to overlook the loss of liberty. When the Nazis came to power, Germany was deep in the Great Depression, with many millions of people unemployed. After changing the rules on what made a person "unemployed" (such as not counting Jews, people under conscription and women), as well as mass public works programs (such as the construction of Germany's Autobahn) and restrictions on workplace ability to fire workers, Germany did report record low unemployment by the time the war began. Besides cheating to report mass spikes in employment, the Nazis also propagated the Stab-in-the-back legend to discredit the Weimar-era republic and left-leaning ideology in general. Hitler saw those people not as they were, but what they were symbolically; so even though Jews had vanished from German life in 1941, they were still blamed as the forces behind the Soviet war effort, the Anglo-American bombing campaign, and the endless threat of invasion by England. For many Germans, though, what helped improve the image of the Nazis was the military pride and the dismantling of the Treaty of Versailles. At the end of World War I, Germany was slapped with various punitive sanctions for "causing the war", such as the entire Rhineland area being demilitarized (as well as restrictions on the German military), various areas of the nation being given to other countries, and mass financial reparations to the allied powers. After initial enforcement of the treaty with a heavy hand, Germany was allowed to have breathing room and plans were set up that would actually allow them to pay the reparations owed. With the Depression, though, repayments were ended and, with the coming of Hitler, denounced entirely. Free from monetary obligation, the Nazis also ran roughshod over other portions of the treaty, such as the military buildup, end of the Rhineland occupation, the annexation of Austria (which was something many had wanted to do in 1918), and the reacquisition and expansion of German territory in Poland following the beginning of the second war. Even early in the second war, Nazi success, particularly the sudden and swift defeat of France and initial victories in the East, facilitated acceptance of the Nazis and a weakness in the German Resistance, forcing various groups to shelve plans to overthrow Hitler. By the time the tide had turned against Germany in 1943 and Germans began to sour on Nazi Loyalty, it was too late to really salvage the situation. ↑ By the way, this is the origin of "Bernie killed Rosa": Luxemburg was killed when the Worker's Party sent in fascist militias to quell a Communist uprising. ↑ "Nazis Raiding Trade Unions", Madera Tribune No. 2, 2 May 1933. ↑ "Nazi Conspiracy and Aggression Volume IV Document No. 2277-PS", Yale Law School. ↑ "Law to Remove the Distress of the People and the State" Hah. ↑ "Röhm Purge", United States Holocaust Memorial Museum. ↑ Excerpt from The Face of the Third Reich by Joachim C. Fest (1992) via Amazon Books. ↑ Streaky, James, "Homosexuals and the Third Reich", The Body Politic, Issue 11, January/February 1974 via Fordham University. ↑ "Subsequent Nuremberg Proceeding, Case #5, The Flick Case", United States Holocaust Memorial Museum. ↑ "Subsequent Nuremberg Proceeding, Case #6, The IG Farben Case", United States Holocaust Memorial Museum. ↑ Shirer, William L., The Rise and Fall of the Third Reich p.252, Simon & Schuster 1960. ↑ Circular from Dr. Robert Ley, Staff Chief of NSDAP Political Organizations, on the Action to “Coordinate” the Free Trade Unions via German History in Documents and Images, April 21, 1933. ↑ Stolper, Gustav, German Economy 1870-1940: Issues and Trends p. 110, Reynal & Hitchcock (1940). ↑ Lee, Stephen J., Weimer and Nazi Germany p.64, Person Education 1996. ↑ Lepage, Jean-Denis G.G., Hitler's Armed Forces Auxiliaries: An Illustrated History of the Wehrmachtsgefolge, 1933-1945 p.61, McFarland 20 October 2015. ↑ Evans, Richard J., "Volkswagen’s Dark Past", History.net 29 September 2015. ↑ Greenwood, H. Pows, "Germany's Handling of Unemployment", Spectator 2 MARCH 1934, Page 7. ↑ Meskill, David, Optimizing the German Workforce: Labor Administration from Bismarck to the Economic Miracle (Monographs in German History) p.147, Berghan April 2010. ↑ Stephenson, Jill, Women in Nazi Germany p. 51, Routledge, 1st edition (October 7, 2001; originally published 1975). ↑ Ermarth, Fritz, The New Germany: National Socialist Government in Theory and Practice] pp. 99–100, Digest Press (1936). ↑ "Otto Strasser, 76, Theoretician Who Broke With Hitler, Is Dead", NYT 28 August 1974. ↑ Stoddard, Lothrop, Into the Darkness: Nazi Germany Today p.90, Duell, Sloan & Pearce (1940). ↑ "Anti-Jewish Legislation in Prewar Germany", United States Holocaust Memorial Museum. ↑ Glancey, Jonathan, "The VW Beetle: How Hitler’s idea became a design icon", BBC 21 October 2014. ↑ Kitchen, Martin, Speer: Hitler's Architect p. 133, Yale University Press 2015. ↑ Megargee, Geoffrey, "Hitler's Leadership Style", BBC. Last updated 30 March 2011. ↑ Ermarth, op. cit., p. 87. ↑ Bonn, M. J., “The Economic Future of Germany”, Contemporary Review November 1939, p. 543. ↑ Ermarth, op. cit., p. 167. ↑ Hitler, Adolf, speech given at Rheinmetall-Borsig Works in Berlin, 10 December 1940. ↑ Poole, Kenyon E., German Financial Policies 1932-1939 p. 258, Harvard University Press (1939). ↑ Balogh, Thomas, “The Economic Background in Germany,” International Affairs, March-April 1939, 234–5; p. 239. ↑ Tyson, Joseph Howard, The Surreal Reich p.119, iUniverse 2010. ↑ Rich, Norman (1972). Hitler's War Aims: Ideology, the Nazi State and the Course of Expansion, pp. 237-246. ↑ Franco, Jere Bishop (1999). Crossing the pond: the Native American effort in World War II. University of North Texas Press. p. 21. ISBN 1-57441-065-2. ↑ Rich (1974), p. 329. ↑ Leitz, Christian (2004). Nazi foreign policy, 1933-1941: the road to global war. Routledge. p. 114. ISBN 0-415-17423-6. ↑ Weinberg, Gerhard L. (2005). A World at Arms:a Global History of World War II. Cambridge University Press. p. 13. ISBN 0-521-61826-6. ↑ Rich (1974), p. 415. ↑ Adichie, Chimamanda Ngozi, "Rereading Albert Speer’s “Inside the Third Reich”", New Yorker 1 August 2017. ↑ Welch, David, "Nazi Propaganda", BBC 17 February 2011. This page was last modified on 15 April 2019, at 17:56.